ASTANA, 28 June 2007 - The Sixth Central Asian Forum on Education was held in Kazakhstan’s capital Astana on 26-28 June 2007. The Forum renewed its commitment to the six Education for All (EFA) goals and decided to continue the Forum in support of capacity building and regional cooperation. The Forum was hosted by the Kazakhstan Ministry of Education and Science in partnership with the United Nations Educational, Scientific and Cultural Organization (UNESCO) and the United Nations Children’s Fund (UNICEF). The Forum is being held on a rotational basis. 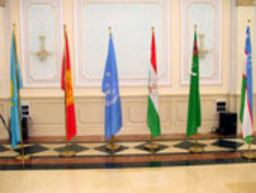 The previous host, the Ministry of Education of Turkmenistan passed on the Forum flag to the Kazakhstan as the symbol of continuity. The Deputy Ministers and representatives of education ministries of Kazakhstan, Kyrgyzstan, Tajikistan, Turkmenistan and Uzbekistan, representatives of UNESCO, UNICEF, UNDP, non-governmental organizations specializing in education, and other international and donor organizations and experts attended the Forum. In his opening speech, Zhanseit Tuymebayev , Minister of education of Kazakhstan stressed the importance of the Forum in the regional Central Asian cooperation. “Education for All means that it is indeed for all, including children with special needs and children from poorest families and ethnic minorities” , UNICEF Representative in Kazakhstan Alexandre Zouev told the participants of the Forum. He stressed that for those countries which have already solved the main issues of providing children and youth with access to all types of education, it is now time to work deeper in the quality of education and its universality. The Ministerial Forum was preceded by a technical workshop on the on-going EFA Mid-Decade Assessment (MDA) on the countries’ progress towards the six internationally agreed EFA goals. The workshop was led by technical experts from UNESCO’s regional bureau for education statistics as well as UNESCO and UNICEF education specialists based in Kazakhstan. UNESCO’s Asia-Pacific Regional Director for Education, Sheldon Shaeffer stressed that the EFA and its mid-decade assessment should be integral parts of all national development and donor strategies for education as well as of the coordination mechanisms between different partners. .
“The EFA mid-decade assessment and subsequent policy reviews are meant to accelerate the progress towards the EFA goals and define the remaining challenges”, he said an reminded that the challenges are even more important than achievements. The Forum noted that the countries in the region have made tangible progress in improving the education systems in terms of quality, accessibility, and funding. Minister Zhanseit Tuymebayev said that Kazakhstan’s investment in education had increased sixfold since 1998. Progress is also being made in the computerization of schools and encouraging children to strive for better results in their studies. However, not all the countries are making equal progress to achieve the EFA objectives due to a number of reasons, including the lack of financing and unequal development of economies in the region. In the on-going mid-decade assessment, the countries have encountered such problems as dealing with new statistics and evaluation forms, lack of analytical potential and experience in monitoring and evaluation, absence of statistics on non-formal education, and the absence of statistical data on the use of child labour. The Forum participants adopted a resolution to support the speeding up the progress towards the EFA Goals. The Resolution stressed the need to modernize the Forum’s objectives in favour of technical capacity building and regional partnerships. The resolution also stressed how important it is to integrate the results of the EFA mid-decade assessment into the he national education policies and development strategies. - improving quality of education . These pledges preceded the Millennium Declaration and Millennium Development Goals which another key set of development objectives which the whole international community has committed to collectively achieve.